The barons of the court of King John had invited Louis, the son of Philip of France and husband of John's niece, to come and be their king. 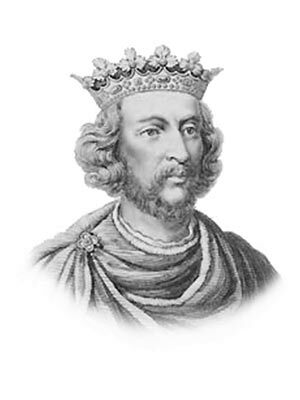 When King John died London was in the hands of his worst enemy, Louis the son of the King of France.King John left two little sons, Henry and Richard aged nine and seven years old. Many English barons felt that they would rather have the young boy Henry as their king than the French Louis. Henry was crowned as King Henry III aged just nine years old at Gloucester and swore to rule according to Magna Carta which had been signed by his father King John. Hubert de Burgh undertook to govern for him. Louis was beaten in a battle at Lincoln; and when his wife sent him more troops, Hubert de Burgh got ships together and sunk many vessels, and drove the others back in the Straits of Dover; so that Louis was forced to go home to France and leave England in peace. England was ruled by regents until 1227. When Henry reached maturity, however, he was keen to restore royal authority. Bad advisers persuaded him to let them take loyal Hubert de Burgh and imprison him. He had taken refuge in a church, but they dragged him out and took him to a blacksmith to have chains put on his feet; the blacksmith however said he would never forge chains for the man who had saved his country from the French. De Burgh was afterwards set free, and died in peace and honor. Henry was a builder of beautiful churches including Westminster Abbey. The Pope was always sending for money, and the king tried to raise it in ways that, according to Magna Carta, he had sworn not to do. His foreign friends told him that if he minded Magna Carta he would be a poor king and whenever he listened to them he broke the laws of Magna Carta. Then, when his barons complained and frightened him, he swore again to keep them; so that nobody could trust him. When they could bear it no longer, the barons all met him at the council which was called the Parliament, from the French word meaning talk. This time they came in armor, bringing all their fighting men, and declared that he had broken his word so often that they should appoint some of their own number to watch him, and hinder his doing anything against the laws he had sworn to observe, or from getting money from the people without their consent. King Henry III was very angry; but he was in their power, and had to submit to swear that so it should be; and Simon de Montfort, Earl of Leicester, who had married his sister, was appointed among the lords who were to keep watch over him. Henry could not bear this; he felt himself to be less than ever a king, and tried to break loose. He had never cared for his promises; but his brave son Edward, who was now grown up, cared a great deal: and they put the question to Louis, King of France, whether the king was bound by the oath he had made to be under Montfort and his council. This King Louis was son to the one who had been driven back by Hubert de Burgh. He was one of the best men and kings that ever lived, and he tried to judge rightly; but he scarcely thought how much provocation Henry had given, when he said that subjects had no right to frighten their king, and so that Henry and Edward were not obliged to keep the oath. Thereupon they got an army together, and so did Simon de Montfort and the barons; and they met at a place called Lewes, in Sussex. Edward got the advantage at first, and galloped away, driving his enemies before him; but when he turned round and came back, he found that Simon de Montfort had beaten the rest of the army, and made his father and uncle Richard prisoners. Indeed, the barons threatened to cut off Richard's head if Edward went on fighting with them; and to save his uncle's life, he too, gave himself up to them. Simon de Montfort now governed all the kingdom. He still called Henry king, but did not let him do anything, and watched him closely that he might not get away; and Edward was kept a prisoner--first in one castle, then in another. Simon was a good and high-minded man himself, who only wanted to do what was best for everyone; but he had a family of proud and overbearing sons, who treated all who came in their way so ill, that most of the barons quarreled with them. All who were discontented with the Montforts joined Edward, and he soon had a large army. He marched against Montfort, and met him at Evesham. The poor old king was in Montfort's army, and in the battle was thrown down, and would have been killed if he had not called out "Save me, save me, I am Henry of Winchester." His son heard the call, and, rushing to his side, carried him to a place of safety. His army was much the strongest, and Montfort had known from the first that there was no hope for him. "God have mercy on our souls, for our bodies are Sir Edward's," he had said; and he died bravely on the field of battle. Edward brought his father back to reign in all honor, but he took the whole management of the kingdom, and soon set things in order again taking care that Magna Carta should be properly observed. When everything was peaceful at home, he set out upon a Crusade with the King of France, and while he was gone his father died, after a reign of fifty-six years. Some interesting facts and short biography information about the History, Life & Times of King Henry III. Additional details, facts, history and information about the famous Medieval Kings of the Middle Ages and important events during their times can be accessed via the Middle Ages Sitemap and the section detailing the life and times of the Kings of the Middle Ages.